Lake Lugano is located in the south of the Tessin canton, between Lake Maggiore and Lake Como, on the border between Italy and Switzerland. It is a gorgeous holiday destination that offers the best of those two nations. On its shores, tourists will find everything they desire and many things to do: watersports and mountain sports, arts and culture, tasty food and great wines, history and traditions, many festivals and events and a lively nightlife. 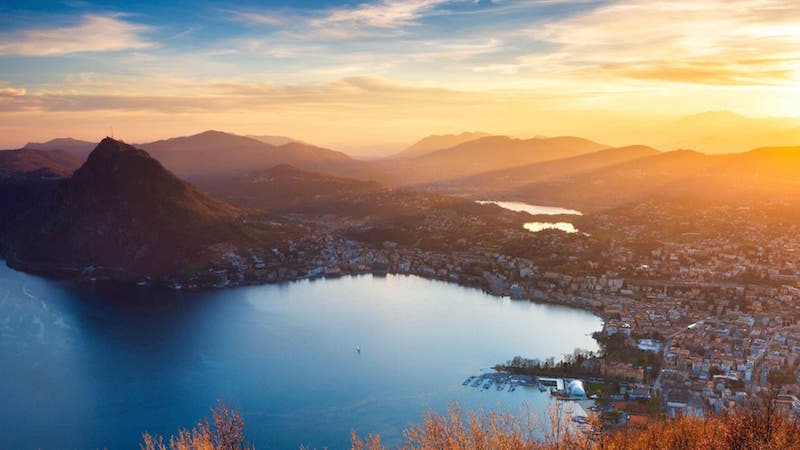 Thanks to its mild climate, Lake Lugano is like a little Mediterranean Sea nestled between the Alps, with palms and lemon trees on its shores. The weather it is enjoyable all year round, attracting visitors from all over the world. Lake Lugano is also known as Lake Ceresio, a roman name that derives from the many cherry trees of past times. Those seeking natural beauty will find many wonderful sightseeing spots between the shores and the mountains. A boat trip of the lake is a romantic and suggestive experience, especially if done by night, and many funicular railways or rack railways will bring you easily from the water to the snowy tops of the nearby mountains. With the rack railway, you will reach Monte Generoso, the highest top by the lake, while the funicular railways get you to Monte San Salvatore and Monte Brè. Lake Lugano is also known for Monte San Giorgio, which is a UNESCO World Heritage Site rich in rare plants and fossils. Lugano is a city full of museums and theaters and it has much to offer in terms of culture, art and entertainment. There are plenty of festivals and events for the classic music lovers, while those who want to go shopping will find artisan workshops and local markets specialized in craft products, alongside the most exclusive and luxurious boutiques. 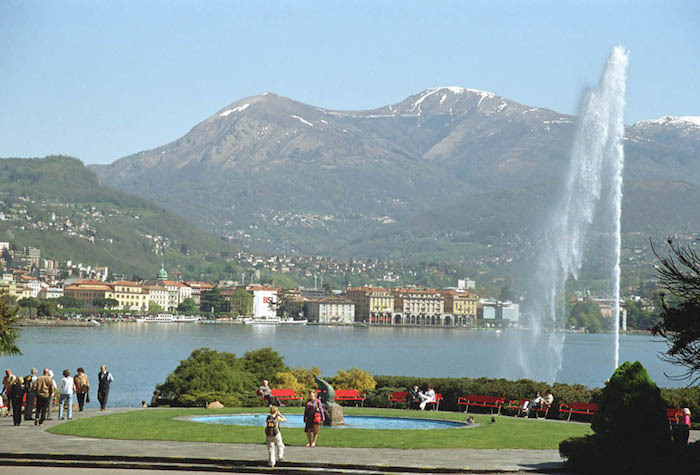 The entire area offers a vast number of hotels, bed and breakfast, inns, restaurants and café, and the city of Lugano has many parks and promenades for your strolls and peaceful hours. Besides Lugano, there are many villages and little towns to visit in the area: Gandria, Brusimpiano, Morcote, Lavena Ponte Tresa, Carona o Porlezza are all rich in history and culture, with many museums, art galleries and medieval churches. The entire area is a food lover’s dream: while fish dishes are obviously a must, Lake Lugano offers much more. Local cheese and cold cuts are unmissable and the polenta (made with corn flour) is a typical winter dish. Another great winter food is the Alplermagronen; it is a tasty pasta with potatoes, butter, onion, cheese and a Swiss sausage called cervelat. Lake Lugano is also well known for its red wines: while the Merlot is the king of the area, you will also find some great Cabernet and Pinot Nero. Those who prefer white wines will have plenty of good Sauvignon and Chardonnay. You can do a unique and magic tour of Lake Lugano by visiting some of its grottos and wine cellars to make some tastings discovering new wines. A great way to complete this culinary trip is to reach the Swiss town of Caslano: there you will find the Alprose Chocolate Factory to sweeten your palate with some of the best Swiss chocolate. Sports lovers will also find many ways to have fun: between the lake, rivers and mountains you will be able to practice hiking, horse-riding, climbing, golfing, trekking, rafting, mountain biking, sailing and other watersports. After the sports, you can go to many spas and beauty centers to get some rest, relax and get ready for the crazy nights. While Lake Lugano is a really quiet and relaxing place, its nightlife is rich and wild: pubs, dance halls and nightclubs are open until late and will keep you entertained all night long. Some time in Lake Lugano? Moreover, if you stay in Lake Lugano for some time and you want to try something different you will have many choices: from Lugano you will reach easily either Milan or Venice, and Lake Maggiore and Lake Como are close by. 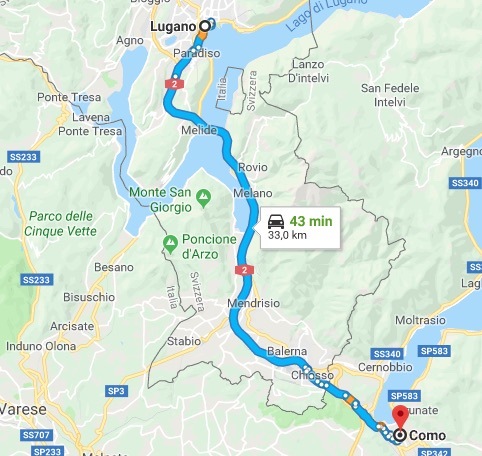 It is possible to reach Lugano from Como (and vice versa) by car, bus or train. From COMO Fs San Giovanni there are buses that arrive in Lugano (via Ciani, centro) in maximum 50 minutes (5 €, Flixbus). From lake Como to lake Lugano by train (37 minutes: stops: Como S.Giovanni, Chiasso, Lugano). From Lugano airport (via Aereoporto 6982, Agno) to lake Como: 1 h/1 h 15 minutes. From Lugano airport you have to walk to Serocca (800m, 11 min), with train S60 there are 6 stops (Bioggio, Bioggio Molinazzo, Cappella-Agnuzzo, Sorengo Laghetto, Sorengo: 13 minutes) and you will arrive to Lugano FLP. Here you can find train for Como San Giovanni or Milano Centrale, you have to get off in Como San Giovanni station.